WayForward is a developer that doesn’t get quite enough love. They’re a bonafide collection of miracle workers, in my opinion, who are able to both pull off compelling original IPs (Mighty Switch Force, Sigma Star Saga) and breathe new life into dormant properties (Contra 4, Double Dragon Neon) in between putting out solid licensed kids’ games. But their flagship product, undisputedly, is their Shantae franchise—a charming series of platformers about a cute genie girl. 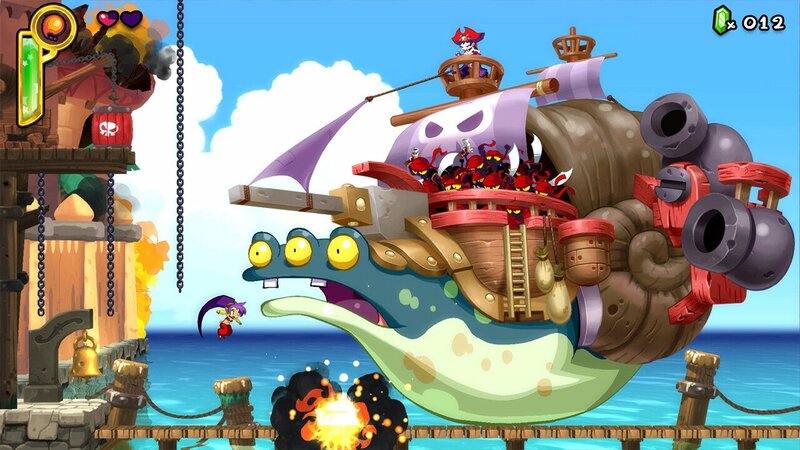 Yet Shantae: Half-Genie Hero, the latest in the cult franchise, represents somewhat of a major change for the series. This is apparent as soon as players fire up the game and the gorgeous 2D art graces the screen. 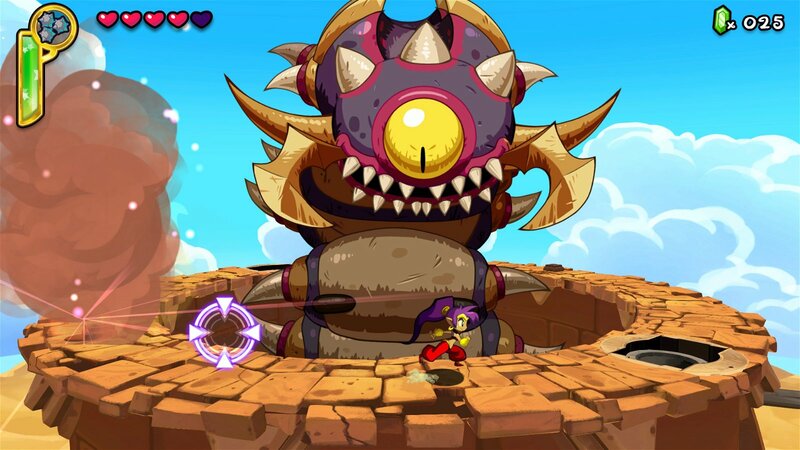 Half-Genie Hero is a marquee title, with some serious dosh put into the production values. The bits and pieces of voice acting, lively and fluid animation, all-star production team, and one of the year’s finest scores cement the game’s status as a major undertaking with some serious financial backing. Considering the franchise’s humble beginnings as a Game Boy Color title that, to crib a line from Shantae herself, “sold like buns,” it’s gratifying to see Matt and Erin Bozon’s almost two-decade-old passion project realized with such lush attention to detail. But when you put aside the inflated budget, strip away the eye and the ear candy, you’re left with what WayForward does best: old-school design philosophies fine-tuned for modern audiences. 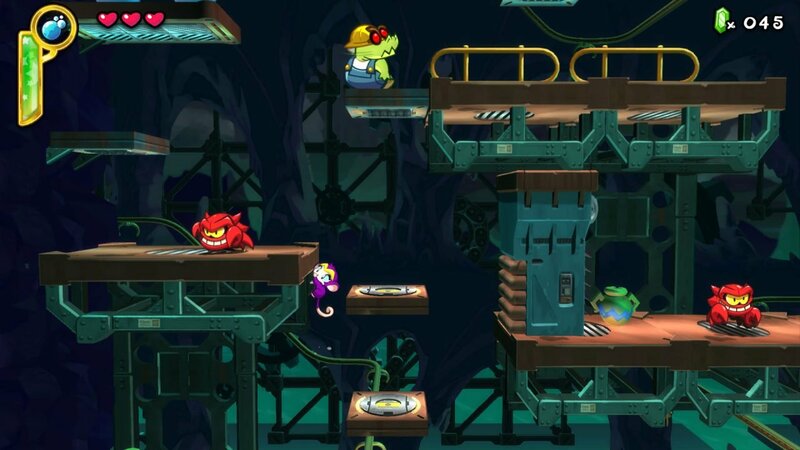 The threadbare plot exists purely as an excuse to send Shantae jumping, climbing, swimming, and hair-whipping her way through a series of bright, whimsical worlds to collect X amount of Y objects for Z purposes. In other words, it’s an old-school collect-a-thon, through and through. That isn’t meant as a pejorative, either. Speaking personally, I’d much rather collect blobfish for a concerned grandmother or human remains for a desert-dwelling hermit than climb a dozen towers and dive into two dozen haybales. When it comes to motivating players to pursue a cubic ton of collectibles, a little personality goes a long way, and Half-Genie Hero has personality to spare. Its witty, self-aware dialogue, spouted by a cast of characters that includes a ditzy zombie girl and a market-savvy Skeletor wannabe, genuinely invested me in the hunt. It never felt like I was collecting nebulous stuff for no reason. The game is very good at making even the most trivial of collectibles feel important. It helps, too, that the game itself is very fun to play. 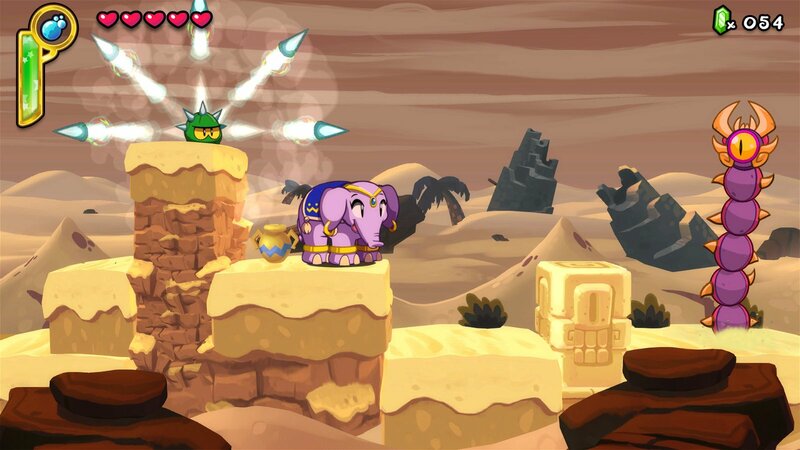 Half-Genie Hero is a successful blend of Genesis-style action platformers and Simon’s Quest-esque exploration. Players go through levels at a blistering pace the first time through, bounding through magic carpet races and windy deserts with relative ease. It’s upon the mandatory revisits of these levels, however, that the true challenge sets in. In each of the levels, there’s a lot of content not immediately visible or accessible at first blush. Players will find themselves sifting through the second level (a sprawling mermaid sanctuary) to complete mandatory quests near the end of the game, and even then, there’s a good chance that they’ll still be missing things. This exploration is aided by Shantae’s main gimmick: the ability to transform through belly dancing. She can dance herself into monkeys, mice, harpies, elephants, and four other additional forms. Each of these forms can upgraded with new abilities picked up through doing fetch quests, which in turn allow players to complete even more fetch quests, on top of just messing around in new, more challenging areas. The way that Half-Genie Hero re-contextualizes whole maps by just giving players new abilities is really very impressive, and something that gives the whole package a hidden level of depth not immediately apparent. It’s worth mentioning, though, that this exploration comes at the expense of focus in other areas. Most notable in that sense are the boss fights, which all pretty much feel like afterthoughts. Despite some truly sublime visual design work on them, these duels usually result in Shantae standing in one or two places, whapping something with her hair, and not much else. One particular fight in the desert level even feels like a direct copy-and-paste from a handheld Sonic title from a while back. An endgame boss didn’t even force me to move but once or twice. With all the effort put into tight controls, intricate levels, loads of content, and some astounding art, it’s kind of a shame that the bosses feel so phoned in and lack any real challenge. They’re the only part of Half-Genie Hero that feels like a case of style over substance. That said, it really is the only part. 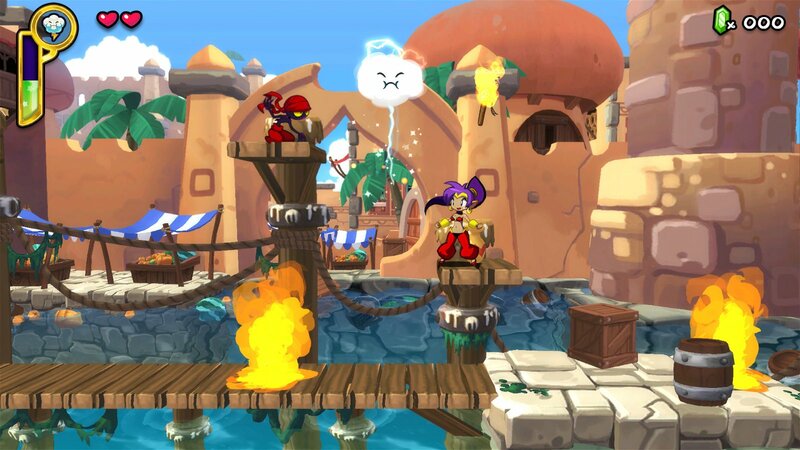 Shantae: Half-Genie Hero is a truly charming game, all told. WayForward has put out something that is both aesthetically stimulating and mechanically engaging, striking a sound balance between old-school depth and new-school accessibility to produce a product that players from any era can enjoy. As the last major release of 2016, Shantae: Half-Genie Hero is a sweet, happy note to go out on. 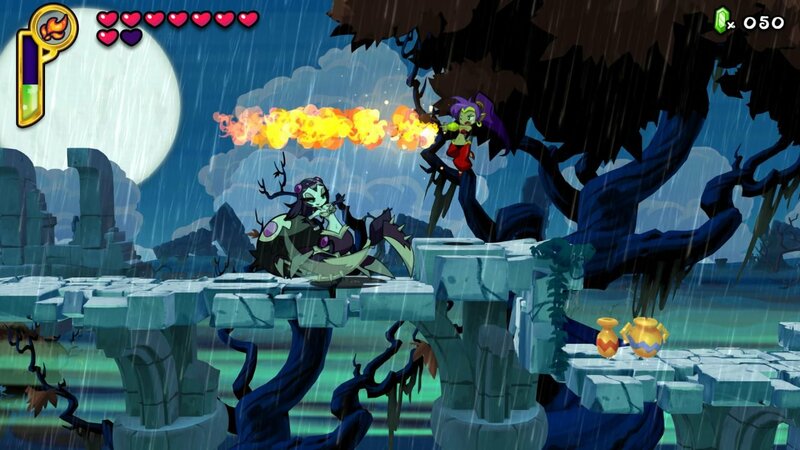 Shantae: Half-Genie Hero is WayForward’s finest entry in the series yet. Platformer enthusiasts and people who can’t get enough of collecting virtual trinkets will undoubtedly find something to get lost in here.